As further evidence that Apple plans to dramatically expand location services and navigation in a future version of iOS, a new job listing reveals the company is working on "exciting new features" for location-aware software on the iPhone. The company's continued strong interest in offering even more location services to iPhone users was revealed this week in a new job listing discovered by AppleInsider. Apple is looking to hire someone for the role of "iOS QA Location Engineer," a position that will be based out of the company's Cupertino, Calif., corporate headquarters. "You will join a dynamic team responsible for qualifying the latest iOS products, working on exciting new features for iOS location services," the listing reads. "The successful candidate will complete both documented and adhoc testing to ensure high quality releases." Specifically, a preferred candidate will have experience with GPS as well as "navigation algorithms," suggesting that Apple could be working on a turn-by-turn navigation service similar t the free Google Maps Navigation. Apple has been looking to expand location services provided with iOS, the mobile operating system that powers the iPhone and iPad, for some time. In fact, in April the company publicly admitted it is building a "crowd-sourced traffic" service for iPhone users that will arrive in "the next couple of years." There are indications that Apple has been on a hiring spree in 2011 to improve its Maps application and location services. For example, in March, the company posted a number of listings related to developing location services for iOS, while another advertisement in March revealed the company is looking to "radically improve" Maps for the iPhone along with location services. While there has been no indication that Apple's new crowd-sourced traffic service will arrive as part of iOS 5, location services will still play a significant role in the forthcoming software update for the iPhone and iPad. 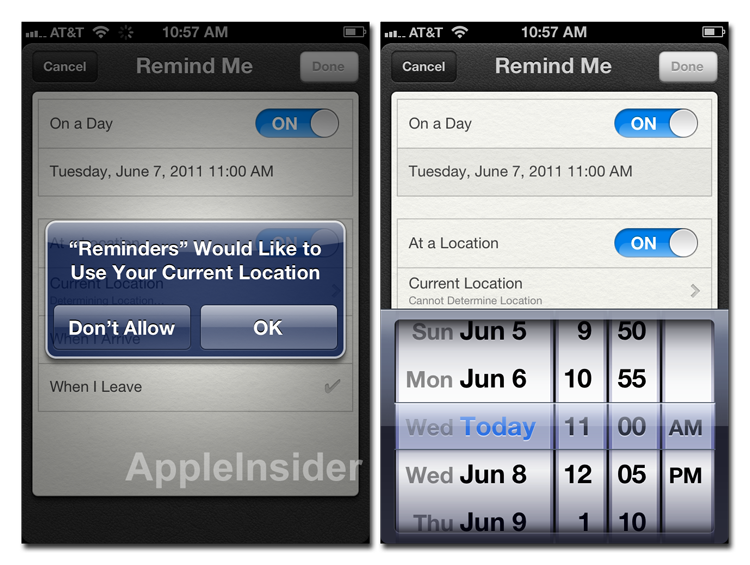 One major feature is the new Reminders application, which offers location-aware to-do lists which can issue an alert to a user when arriving at a specific pre-set location. The Cupertino company also purchased Google Maps competitor Placebase in 2009, and in 2010 it acquired another online mapping company, Poly9. And last year, starting with iOS 3.2, Apple began using its own location databases for the Maps software on iOS devices like the iPhone, moving away from databases maintained by Google and Skyhook Wireless. While Apple now provides location-based services from its own databases, the iPhone maker still relies on Google for maps and "Street View" content in the native iOS Maps application. The company recently renewed its partnership with Google for continued access to that data.